improved on the year-ago total. from the same month a year ago. Anderson, president/owner of Coldwell Banker Evergreen Olympic Realty. Anderson remarked. His analysis revealed a 10-year high for sellers coming to market during October. market and making their move now,” he reported. proposal to cap the mortgage interest deduction is concerning to buyers, brokers and builders. County had selling prices of $500,000 or higher. Existing Homes Sales hit 10-year highs, the National Association of REALTORS reported. January Existing Home Sales surged by 5.69 million annualized units, up 3.3 percent from December to highs not seen since February 2007. All major regions across the nation saw gains, with the exception of the Midwest. The median existing home price rose 7.1 percent from January 2016. Overall inventory of existing homes remained low, however, at just a 3.6-month supply. New Home Sales rebounded in January. The Commerce Department reported New Home Sales rose 3.7 percent from December to an annual rate of 555,000. The increase was below the 566,000 expected, but it comes after a 7 percent decline in December. Sales also were up 5.5 percent from January 2016. The median sale price was up 7 percent from a year ago. Inventories were unchanged at a near-normal 5.7 months’ supply. For those in the market for a new or existing home, home loan rates remain in historically low territory despite the volatility in Stock and Bond markets over the last few weeks. Housing is set to smash records in February, with realtor.com® forecasting both the fewest days on market since the recession and the month’s highest list prices—an early start to the spring home-buying season, says realtor.com Chief Economist Jonathan Smoke. Data from realtor.com indicate the median list price will be $250,000 in February—a record-setter—and listing inventory will be up 2 percent from January to 425,000. The median age of inventory for February, in addition, will be 91 days, a 5 percent dip from both January 2017 and February 2016. 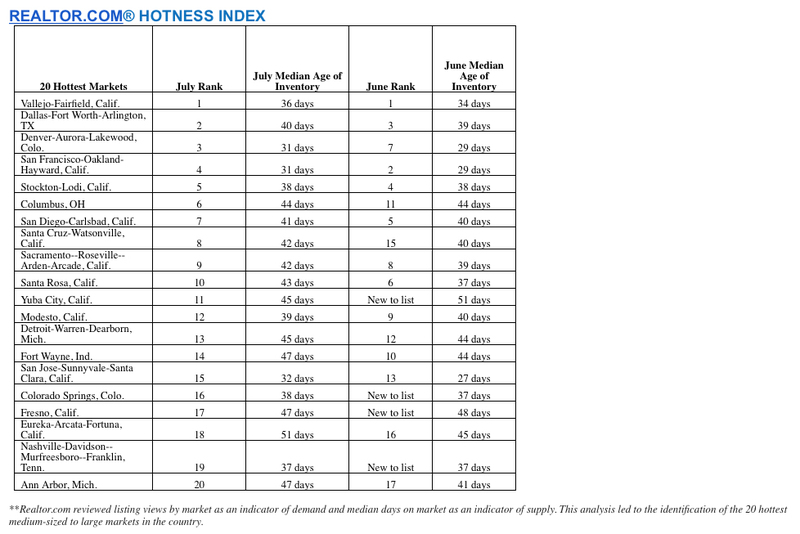 Based on the data, the hottest markets in terms of median age of inventory will be Vallejo-Fairfield, Calif. (33 days), San Francisco-Oakland-Hayward, Calif. (27 days) and Dallas-Fort Worth-Arlington, Texas (44 days). Regional quarterly price growth, per the report, was mixed: 0.7 percent in the Northeast, an increase; 0.8 percent in the Midwest, a decrease; and 1.0 percent in the South and West, unchanged. Home prices in 16 of the top 50 largest metropolitan areas—which contain one-third of the nation’s housing stock—have moved past bubble-era peaks. The result, according to Clear Capital Vice President of Research and Analytics Alex Villacorta, is a majority-shift toward positive equity. The market in Portland, Ore., which saw the highest home price growth in the nation in 2016, continues to rank at the top of metropolitan areas measured in the report, growing 2 percent quarter-over-quarter. Another booming market, however—San Jose, Calif.—saw negative quarterly price growth, down 0.3 percent. Hartford, Conn., saw identical negative growth. “While the expected spring housing boost is still months away, an influx of fresh new demand on the market could further boost growth potential later this year—as long as there are no other shocks to the market,” Villacorta says. Subdued home price growth estimates for 2017 are increasing as end-of-year data becomes available, indicating a slight slowing of movement in the year ahead. CoreLogic, most recently, bumped up its price projection to 4.7 percent year-over-year based on November 2016 prices, which were 1.1 percent higher month-over-month and 7.1 percent higher year-over-year. The 4.7 percent projection is an increase from CoreLogic’s 4.6 percent projection given in October. Mortgage rates exceeded 4 percent for the first time in 2016 at the end of November, and have continued to tread upward since, with the Federal Reserve’s decision to raise the key interest rate in December impacting the climb. The 30-year fixed-rate mortgage closed out 2016 at an average 4.32 percent, according to Freddie Mac. Demand seen in the summer did not let up at the end of the year, during what would typically be a slow season for housing activity, says Jonathan Smoke, chief economist of realtor.com®. Home prices, as measured by the CoreLogic Index, are expected to grow beyond their pre-recession peak by the end of this year. Data released for June 2016 shows that home prices continued their rise across the country over the last 12 months. The S&P CoreLogic Case-Shiller U.S. National Home Price NSA Index, covering all nine U.S. census divisions, reported a 5.1 percent annual gain in June, unchanged from last month. The 10-City Composite posted a 4.3 percent annual increase, down from 4.4 percent the previous month. The 20-City Composite reported a year-over-year gain of 5.1 percent, down from 5.3 percent in May. Portland, Seattle, and Denver reported the highest year-over-year gains among the 20 cities over each of the last five months. In June, Portland led the way with a 12.6 percent year-over-year price increase, followed by Seattle at 11.0 percent, and Denver with a 9.2 percent increase. Six cities reported greater price increases in the year ending June 2016 versus the year ending May 2016. Before seasonal adjustment, the National Index posted a month-over-month gain of 1.0 percent while both the 10-City Composite and the 20-City Composite posted a 0.8 percent increase in June. After seasonal adjustment, the National Index recorded a 0.2 percent month-over-month increase, and both the 10-City Composite and 20-City Composite posted 0.1 percent month-over-month decreases. After seasonal adjustment, nine cities saw prices rise, two cities were unchanged, and nine cities experienced negative monthly prices changes. “Home prices continued to rise across the country led by the west and the south,” says David M. Blitzer, Managing Director and Chairman of the Index Committee at S&P Dow Jones Indices. “In the strongest region, the Pacific Northwest, prices are rising at more than 10 percent; in the slower Northeast, prices are climbing a bit faster than inflation. Nationally, home prices have risen at a consistent 4.8 percent annual pace over the last two years without showing any signs of slowing. The recently released ATTOM Data Solutions 2016 U.S. Natural Hazard Housing Risk Index found that home sales in the first six months of 2016 increased 4.2 percent from the same time period a year ago in the bottom fifth of U.S. counties with the lowest level of natural hazard risk — more than twice the 1.9 percent increase in the top fifth of U.S. counties with the highest level of natural hazard risk. More than 3,000 U.S. counties were indexed based on risk of six natural hazards: earthquakes, floods, hail, hurricane storm surge, tornadoes and wildfires using data collected by ATTOM’s neighborhood research portal www.homefacts.com. ATTOM also analyzed home sales and price trends in more than 800 counties with at least 100 single family home sales in the first six months of 2016. Those 800 counties — which combined have more than 70 million single family homes and condos — were divided into five equal groups (quintiles) based on the natural hazard risk index and assigned to one of five risk categories: Very High, High, Moderate, Low, and Very Low. 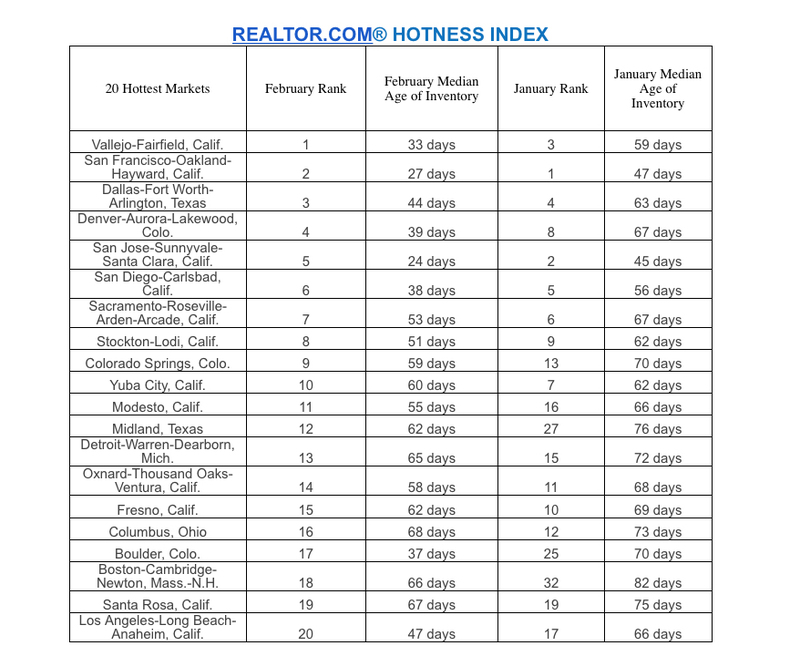 Among the 804 counties analyzed for home sales and price trends, those with a Natural Hazard Housing Risk Index in the Top 5 highest were Oklahoma County, Okla.; Monroe County, Fla. (Key West); Cleveland County, Okla. (Oklahoma City); Nevada County, Calif. (Truckee); and Lake County, Calif. (Clearlake). Among 78 larger counties with at least 5,000 home sales in the first six months of 2016, those with the highest risk index were Oklahoma County, Okla.; Riverside County, Calif. (Inland Empire of Southern California); Collier County, Fla. (Naples); Miami-Dade County, Fla.; and Santa Clara County, Calif. (San Jose). Among the 804 counties analyzed for home sales and price trends, those with a Natural Hazard Housing Risk Index in the Top 5 lowest were Milwaukee County, Wisc. ; Kewaunee County, Wisc. (Green Bay); Racine County, Wisc. (Racine); Knox County, Maine; and Kenosha County, Wisc. (Chicago metro area). Among larger counties with at least 5,000 home sales in the first six months of 2016, those with the lowest risk index were Cuyahoga County, Ohio (Cleveland); Lake County, Ill. (Chicago area); Kent County, Mich. (Grand Rapids); Maricopa County, Ariz. (Phoenix); and Montgomery County, Penn. (Philadelphia metro area). In the 161 counties in the top quintile for natural hazard risk (Very High Risk), there were a total of 21 million single family homes and condos representing 30 percent of all homes and condos in the 804 counties analyzed. In the 161 counties in the bottom quintile for natural hazard risk (Very Low Risk) there were a total of 10 million single family homes and condos representing 15 percent of all homes in the 804 counties analyzed. The average estimated market value for homes in the lowest-risk counties was $187,291 — 33 percent below the average estimated market value for homes in the highest-risk counties: $279,570. The median sales price of single family homes and condos sold between January and June 2016 in the lowest-risk counties was $156,245 on average, 39 percent below the median sales price in the highest-risk counties during the same time period: $255,160. Median home prices in the first six months of 2016 have increased an average of 6.5 percent compared to a year ago in the highest-risk counties compared to a 3.2 percent average increase in the lowest-risk markets during the same time period. Median home prices in the first six months of 2016 are up 9.5 percent from the same time period 10 years ago in the lowest-risk counties compared to a 1.9 percent increase compared to 10 years ago in the highest-risk counties. Furthermore, homeowners in the lowest-risk counties have gained an average of 27.8 percent in home value since purchase while homeowners in the highest-risk counties have gained an average of 20.7 percent since purchase. Over the past five years, increases in home sales volume has fallen below the overall national average in counties with the highest risk of earthquakes, hurricane storm surge, wildfires and floods while counties with the lowest risk for those natural hazards have seen home sales volume increase at a faster pace than the national average over the past five years. Conversely, home sales activity over the past five years has been stronger than the national average in markets with the highest risk of tornadoes and hail while markets with the lowest risk for those natural hazards have seen below-average increases in home sales activity.